The following day, Alejandra and I did a nice hearty breakfast and then we make a basket with some crackers and caviar and wine and cheese. We headed north thru highway 1 and kept driving until we saw our first stop, the Bixby Bridge. It is a beautiful looking bridge, but what is most impressive is that it has a view directly to the Pacific Ocean. And boy, if you can see all sort of marine life!! There were seals and walruses, so it was very incredible to see that area very much alive. One thing that definitely make it a highlight is to see an old guy riding with his 1940 Dodge coupe. Since we were in the “tourist” area, he stopped by and said how a nice couple we made, and then he was very friendly giving us a nice story about the car and the bridge. Happens that his wife died five years ago and every time he made the pilgrimage to the bridge cause that’s where her ashes where spread. Alejandra was totally enchanted and then started crying. Me? Well, I guess a little something caught my contacts, and that’s the story I am sticking to it! Then we continue driving and found the Point Sur Lighthouse, which is the spooky part of the trip. 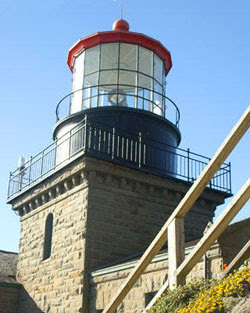 They have a tour that gets you around the lighthouse, and since its one of the oldest in the area, it has amazing stories to boot. Plus, Alejandra is a major Horror geek, so it was awesome the little spooky stories. We weren’t disappointed. You maybe asking about why the basket, well, it was for the final portion of the trip, we travel a little off from the coast, and found the Henry Miller Library. Alejandra’s eyes were sparkling, because as you all know, she is a sucker for poetry and all things literary. We saw things that Henry Miller used for his poems and his novels. And, outside, there’s live entertainment. Either music groups or also they have open mics, which allowed people to write poems or little stories in whichever form. I was totally in awed when in the mist of eating the caviar and drinking our wine, Alejandra stand up and with a piece of napkin she totally floored the people around with a beautiful poem, if I say standing ovation is to say the least, at the end people stopped and talked to her and told her how talented she was!